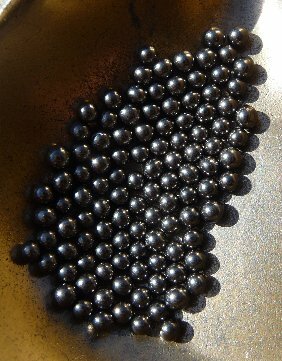 Lead Shot - Competitive prices and bulk discount - on any +shot size. From only £3.40 (collect) per kg. Best quality long drop manufactured lead shot - made in the traditional way in a shot tower. +Sizes #9, #8, #7.1/2, #7, #6.5, #6, #5 (2.0mm,2.2mm,2.3mm,2.4mm,2.5mm,2.7mm,2.8mm). 1kg £4.50 Sample shot or small quantity for the likes of model makers, boat or aero plane ballast etc. 5kg including delivery £29.00 (mainland UK - please check your post code when ordering). 10kg including delivery £46.00 (mainland UK - please check your post code when ordering). 20kg including delivery £82.00 (mainland UK - please check your post code when ordering). Please note if ordering additional items with the 5kg, 10kg or 20kg delivery included shot options then additional delivery charges may apply. *Regret currently over 20kg is collect only (or multiple delivery charges) or we may be able to meet you if out and about traveling. (1) multiples of 5kg and/or 25kg bags. (2) multiples of 25kg bags. All shot is subject to availability at any given time.